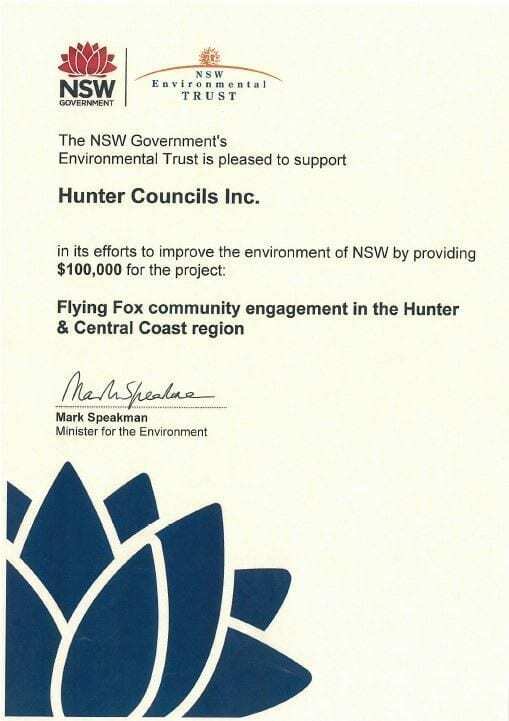 Hunter Councils Inc. was awarded a $100,000 NSW government grant for a flying fox community engagement program, Parliamentary Secretary for the Hunter, Scot MacDonald, announced today. The grant was awarded under the NSW Environmental Trust’s Environmental Education grants program. Mr MacDonald said, “The project aims to bring awareness and management to encourage positive change in the community attitudes to flying foxes through a coordinated regional program of community education and engagement,” he said. “I strongly urged the Minister to support Flying Fox management on a regional bases and this I what this grant achieves. Environment Minister Mark Speakman said more than $1 million was awarded to 14 organisations under this year’s funding round. “These education grants will help community groups, councils and other environmental organisations continue to educate their communities,” Mr Speakman said. “The Environmental Education project will leverage heavily off work currently being undertaken by Councils and the office of Environment & heritage to develop Flying Fox Camp Management Plans and a Hunter Region Flying Fox Management Strategy,” he said.